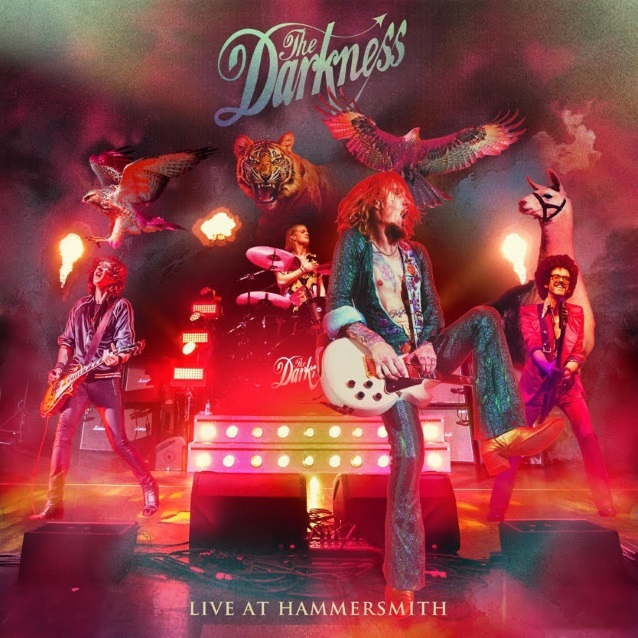 British rockers THE DARKNESS have released a new live version of their hit “Solid Gold”, taken from their upcoming live album, “Live At Hammersmith”, out on June 15th via Cooking Vinyl. In traditional DARKNESS fashion, the new live rendition of “Solid Gold” is a non-stop, breakneck sonic journey of huge riffs, thunderous bass, seismic drums and colossal choruses. It follows the release of “Buccaneers Of Hispaniola” and “I Believe In A Thing Called Love”, all of which were recorded at the band’s monumental Hammersmith Apollo show last year. The tracks are all available as instant grats with pre-orders of the upcoming live album. “Live At Hammersmith” is THE DARKNESS‘s first live album to be released on all formats (including CD, gatefold double vinyl, cassette, download and stream) and spans their spectacular back catalogue of five albums across 19 incendiary tracks. THE DARKNESS headlined Hammersmith as part of the extensive “Tour De Prance”, in support of their latest critically acclaimed album “Pinewood Smile”. The tour saw the band sell out shows across Europe last year. THE DARKNESS is hitting the road again in June and will be playing arenas across Europe in support of the HOLLYWOOD VAMPIRES supergroup featuring Johnny Depp, Alice Cooper and Joe Perry. Following this, they will be supporting QUEEN at TRNSMT festival in Glasgow on July 6 and at Dublin’s Marlay Park on July 8.